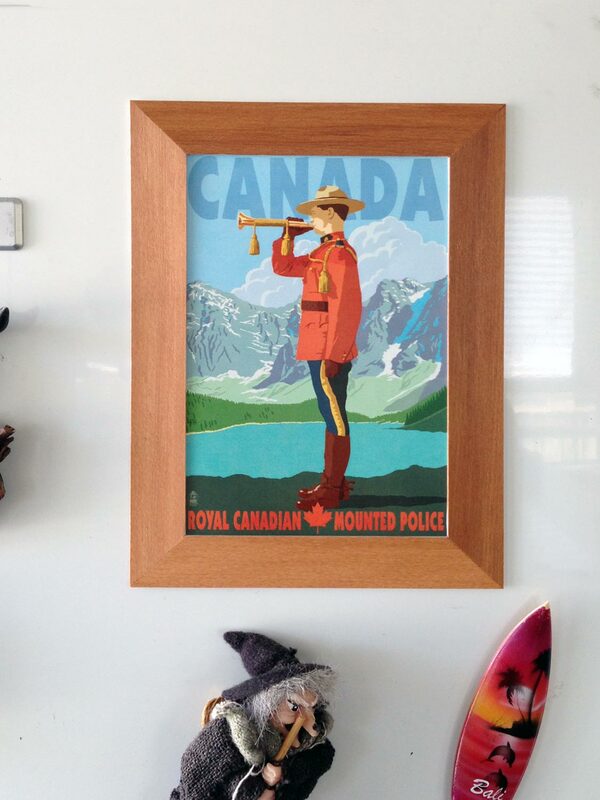 My mum had been looking for a magnetic photo frame but hadn’t been able to find something she liked. So when it was her birthday I thought I would get her one. I couldn’t find anything nice either, a few years ago they had been popular but now there only seemed to be a few really ugly ones around. Since I couldn’t find anything I made a couple instead. I used a sheet of thin wooden veneer that I’d bought a few years ago for a different project but never used. It was from an art supplies store and had an adhesive backing. It was thin so was like working with cardboard. 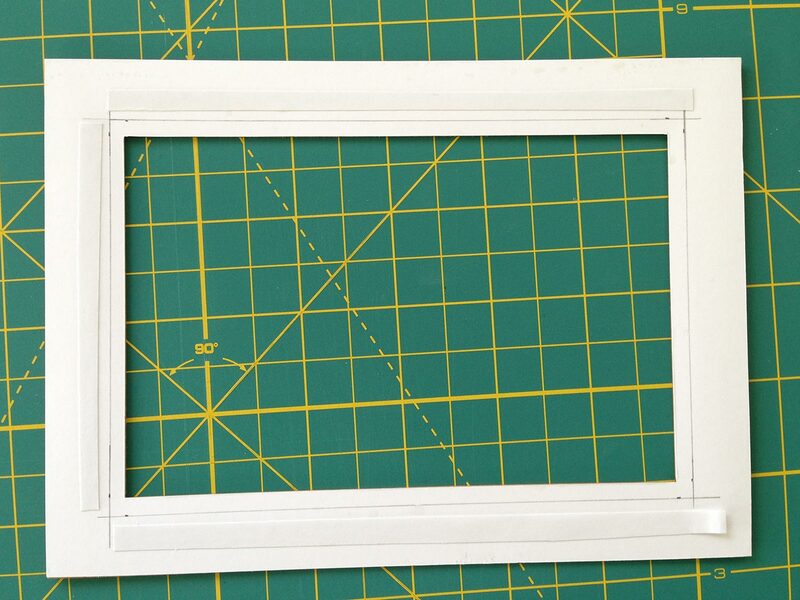 You need to be really precise with the cuts for this to look good, I used a craft knife, ruler and cutting board. The cutting board made it much easier and quicker to do because I could use the grid for right angles and the 45 degree cuts. 1. 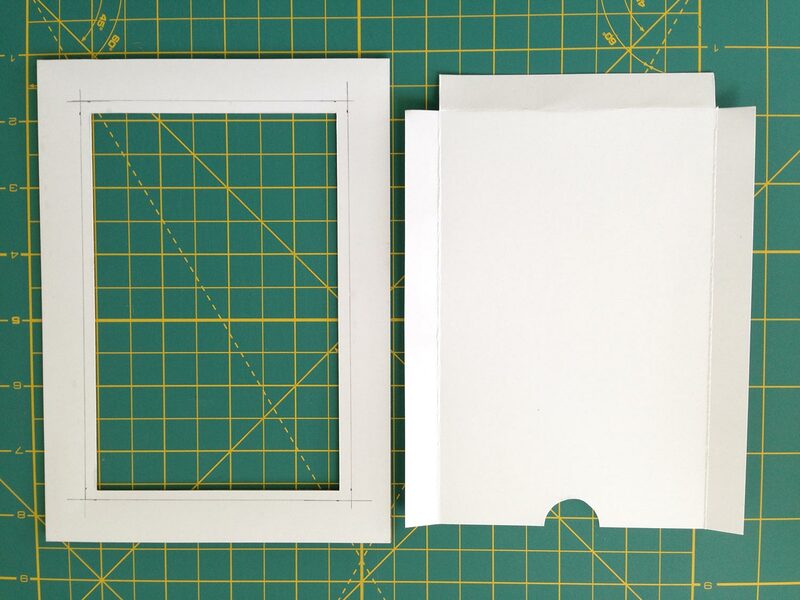 Cut a piece of cardboard to the size of the finished frame, the opening needs to be slightly smaller than the size of the photo so you don’t see the edges of the photo. 2. 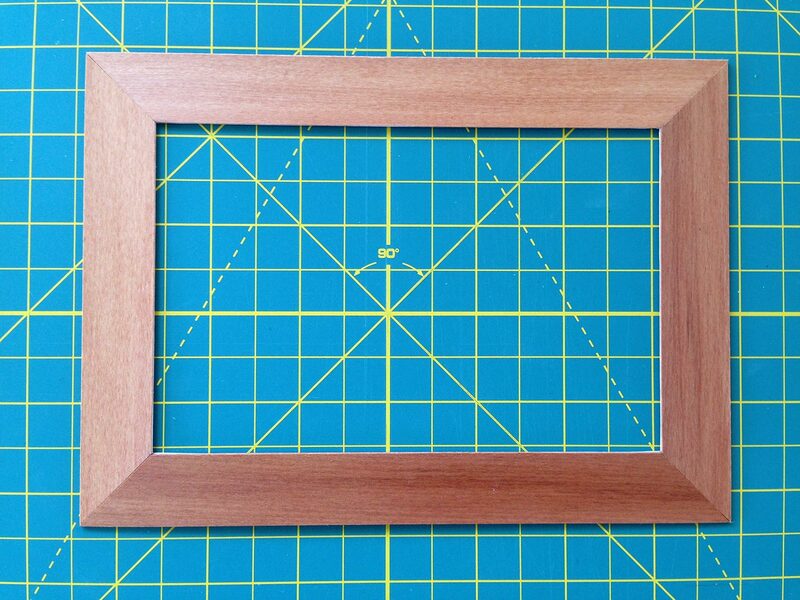 Cut the pieces from the wooden veneer with corners at 45 degree angles (just like a normal wooden photo frame would be). 3. Stick the pieces of veneer onto the cardboard frame (the veneer had a peel back adhesive backing but you could use double sided tape if it didn’t). 4. Cut out a piece of cardboard to go on the back. 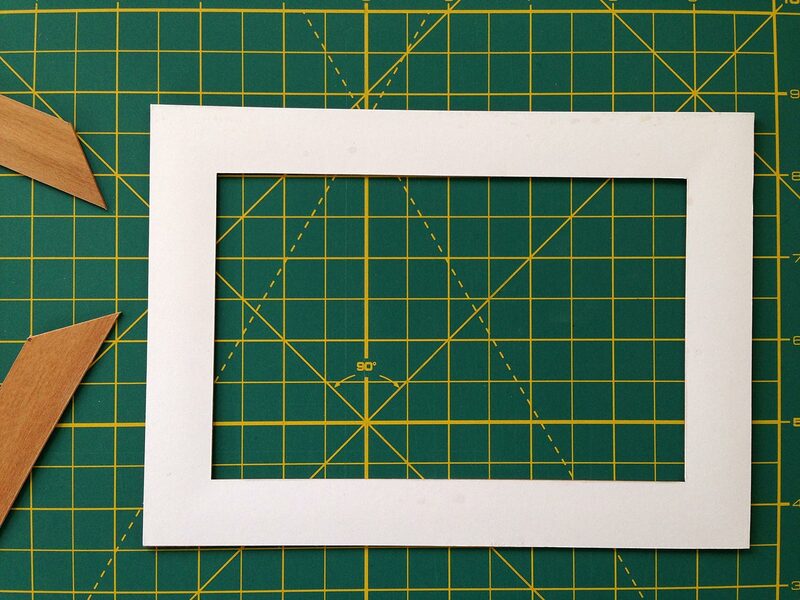 One end needs to have the opening to put the photo in, the cut out circle is to make that easier to do. I creased the cardboard where it would attach to make it a looser for the photo to slip in and out. 5. Attach the backing piece along 3 sides only, I used double sided tape. The pencil line in the photo below shows where the edge of the photo will be, the tape needs to be outside of this. 6. 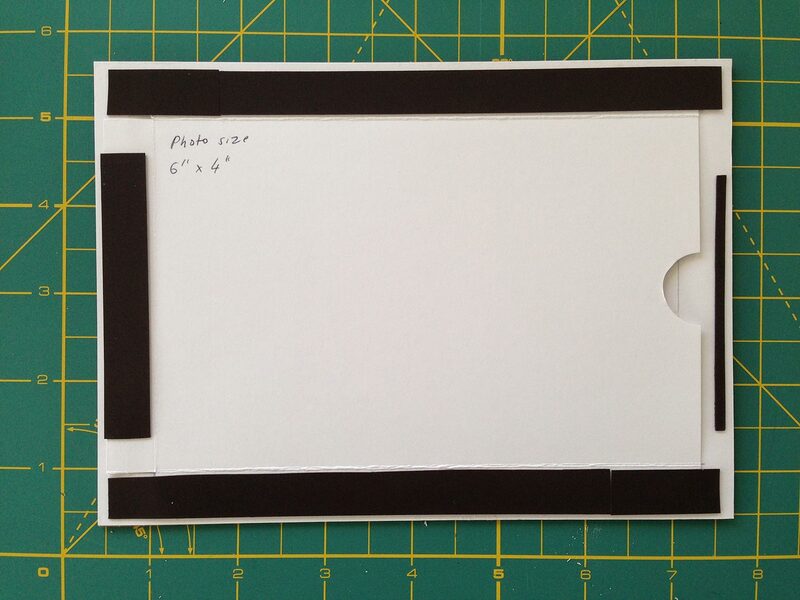 Cut up some flexible magnet and attached it to the back with double sided tape. I used a really thin piece at the end with the opening. I wrote the size of the photo it takes onto the back so it would be easy to remember when getting a photo printed for it.